Love, Christin | A Lifestyle Momprenuer Blog: Treat urself to some EYE CANDY! And by eye candy I mean Glasses! I am in search of new eyeglasses and I recently got contacted to try a new website. What better way to get my new glasses then from the comfort of my home or work in my case, by buying your eyeglasses online! Before this whole blog came about, I never would have imagined all the possibilities I could have like this! And at this point I am very grateful! Any-who, the website name is GlassesUSA.com. I checked out there website and I was already drawn in by the creative and colorful home page! Glasses USA has some of the cutest frames I have seen in a long time, from Gucci (you know I love Gucci), Ray Ban, Vintage, Coach, Tom Ford, Nike, Kenneth Cole, Lacoste, and the list can go on and on! You can shop for your new eyeglasses by frame, style, size, lens type, even the material that it's made by. It's just amazing how many options you have to chose and they also have weekly deals you can shop by. Go figure, I'm on a budget and I know most of you are as well, so why not save, shop and then look great in no time with their fast FREE shipping! These Vintage glasses from just $68! Ray Bans - $148! When the Suggested retail price is at $228.00! They also have RX Sunglasses for men and woman. Their prescription sunglasses protect your eyes from harmful UV ray exposure that can cause permanent damage. Protect your eyes for less with these incredible prices on UV-blocking discount prescription sunglasses. And with a lot of variety to say the least here are some. College Black Sunglasses for men/woman from $78! Maci Pink Sunglasses from $69! 110% Best Price Guarantee - Price matching and an extra 10% off! 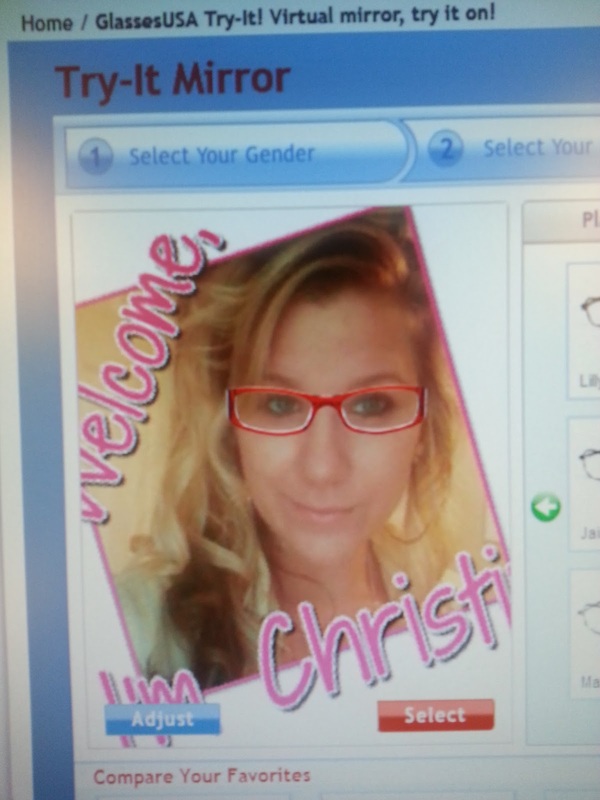 Look this is me trying on the Virtual Glasses! I could totally do red!!!!! Don't ya think? I mean seriously?!?!? What are you waiting for go buy glasses!!!!! GO CHECK THEM OUT NOW!